I texted my midwife and she said to lay down and get some rest since it was almost midnight. I put on my Birthing Time Begins (Hypnobabies track to remind about all the tools for birth) and Easy First Stage (Hypnobabies main hypnosis track to remain deeply in hypnosis during birthing time (labor)) tracks and put it on repeat and laid down in bed and got rest while feeling the waves getting closer. I woke my husband to time them at 3:30 am, they were now 5 minutes apart. I decided to take a shower and see if it would slow down (I was still in denial…I honestly still felt comfortable and was expecting the waves to be more intense so I even was hoping that they were actually even doing something!) 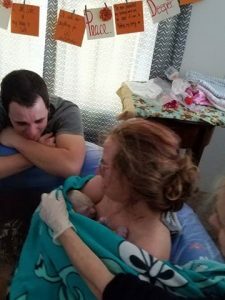 …at 4:30 am I called my midwife and said the waves were now ranging from 3-5 minutes apart, by the time they got there at 5:30 am they were consistently 3-4 minutes. The waves truly felt like a blood pressure cuff! I kept telling myself they were hugs and that mentally helped me so much! I laid down and continued the tracks until 8 am where I felt like I absolutely had to move. I stayed in Center (Hypnobabies technique for being hypnosis and be able to be up and moving around) the rest of my birthing time (Hypnobabies word for labor). At 8 am my midwife checked me once, I was at a 6 and felt so encouraged by this one and only check that my waves were doing something! I was honestly surprised to be at a 6 and feeling good! By 10 am my midwife told me if I wanted to birth in the tub that soon I would be wanting to push, I never even realized I was in transformation! After 1 hour 45 minutes of pushing, Camille Joie was born at noon exactly in the water and nursed within 2 minutes of birth. It was absolutely amazing and very empowering! The only thing I would’ve done differently is that I feel like I was not mentally prepared for how long I would be pushing- I was not able to stay in deep hypnosis for the pushing part and it definitely was the hardest part for me to get through and the only time I questioned my ability because I thought I would push a few times and I kept asking why she hadn’t come out yet-next time around I feel like I will be better able to stay in hypnosis for pushing, I had no idea how long it could take and also where to focus my energy to help her head come further down until my midwife showed me where with her finger. Thank you Hypnobabies! I love that I have no birth trauma, I was able to trust my body and my baby, and have a safe and happy home water birth as a first time mom with a 14.5 hour birthing time that I really only felt in true birthing time the last 4 hours of it!